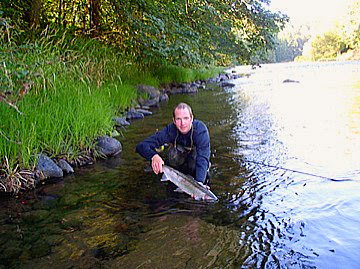 Brian Marz's Fly Fishing Oregon Blog: Summer Steelhead Numbers Looking Great - When Will Water Levels Be? Summer Steelhead Numbers Looking Great - When Will Water Levels Be? The summer steelhead numbers are looking very good, but the water levels for good fly fishing opportunities have been a total bummer as of late. Check out the WILLAMETTE FALLS FISHWAY COUNTS link so you can see the trends in fish passage, and you will sense the frustration of not being able to effectively target these fish the way that we fly anglers would like to be able to. All of these days, chrome bright fish are just marinating in fresh water, and we are not fishing for them. We could be hearing our reel scream with backing sending its way out the rod's tip, but instead we are praying for the water levels to drop. Luckily for us, the time of the year dictates that the rains should eventually cease, and the snow should melt off eventually. Before you know it, we'll be complaining of water levels that are too low and warm (can't imagine that this year.....). Normally, by now I am regularly out on the water targeting summer run steelhead, but this year has been one where I have made a few attempts, but high water has kept me fishing for other species like carp. The count for June 1st was 8,102 summer steelhead over Willamette Falls in the fish ladder. The daily passage is from about 160-400 fish and they should remain at that rate for a while.When the levels drop out; fishing will be red hot with numbers of fish piling up, and a lack of anglers targeting them. Pay attention to water levels, and get yourself out there once they drop!